I greeted Friday evening with a much greater sigh of relief than is usual this week. It hasn’t been a bad week, just a busy one. Plus it was the Bread Winner’s birthday and I’d had to stand him up for lunch which I felt dreadful about. Such is the crazy world of education. All in all, cocktails were in order! This little glass of deliciousness also comes from an airline magazine…. The measurements given make one cocktail. Up to three fit nicely in a standard cocktail shaker. Bring water to the boil. As it heats up, using tongs, hold the cardamom pod close to the flame, rotating until it is roasted all the way around. When the water has boiled, add sugar, cardamom and star anise and simmer for 10 minutes. Allow to cool before using. This makes a large batch and will store well in the fridge for months in a sealed container. Place 2 – 3 cubes of ice in a cocktail shaker. 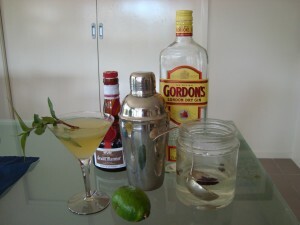 Add special sauce, Grand Marnier, gin and lime juice. 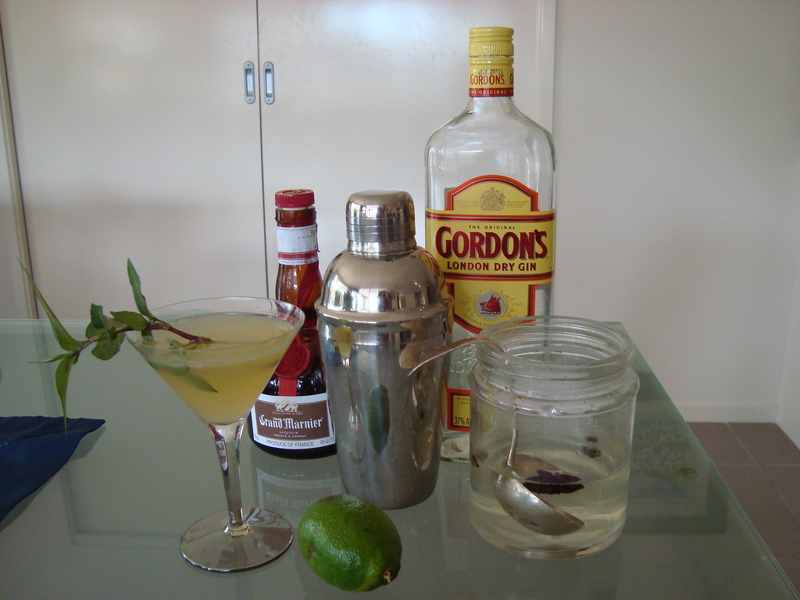 Shake and serve garnished with Vietnamese mint. what is in madame buoi special sauce?? Mrs. Buoi’s special sauce seems to be a variant of fish sauce. From TripAdvisor reviews of Com Ga Ba Buoi, Hoi An, the restaurant started by the famous Mrs Buoi.